Ciragan Palace (now Ciragan Palace Kempinski) is a baroque style Ottoman Palace in Istanbul. Built in the 19th century the palace served to several Sultans only shorty. It is now an extravagant hotel on Bosphorus shore. Enjoy it from your boat trip or take an advantage of the hotel’s services to peek inside. Location: Ciragan Avenue 32, Istanbul. On the Bosphorus shore in Besiktas. Take a bus towards Ortakoy from Kabatas. Or walk from Kabatas through Dolmabahce, along the Bosphorus (50 minutes). Take a look at the hotel from the Bosphorus (on a Bosphorus tour boat or regular ferry from Asian to European side). History. A masterpiece of the Bosphorus. In 19th century new tendency among Sultans emerged. Every new Ottoman ruler preferred to have his own new palace built for residence. Historically, the tradition was to inherit royal residence from a previous Sultan. Ciragan palace was residence of Ottoman Sultan Abdulaziz - the 32nd Sultan of the Ottoman Empire. 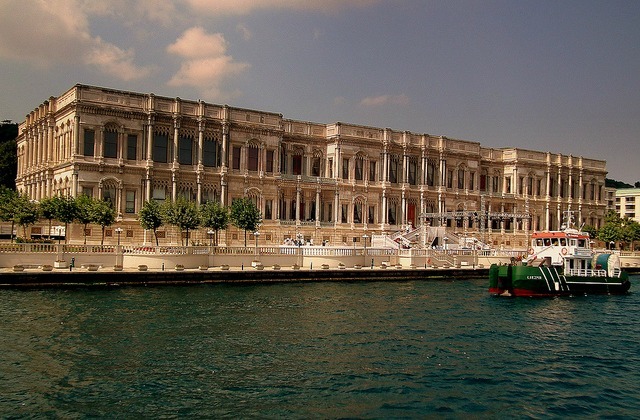 Abdulaziz was the second Sultan to live in a newly built palace after Abdulmecid I who built the Dolmabahce Palace. 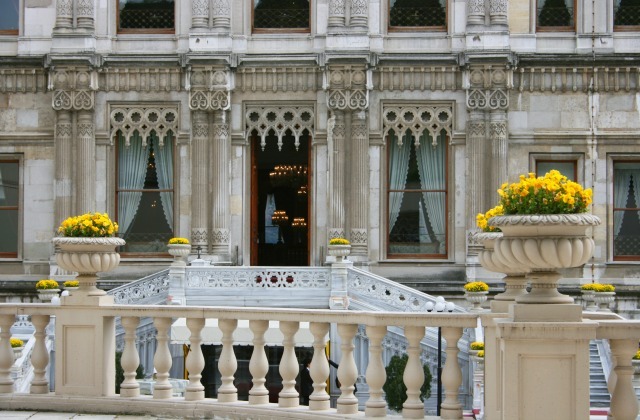 After Abdulmecid I died, Abdulaziz’s French mother named Pertevniyal lived in the Dolmabahce Palace. Ciragan means “lightning” from Persian. The area chosen for the palace had been a place of luxury and enjoyment since 17th century. Originally it was a large garden given as a present to Sultan’s daughter. Named Kazancioglu Gardens, after the family who owned the place, the area was used for festivals and other entertainment for the royal. Later different Sultan’s ministers built their mansions there. Abdulaziz commissioned the Ciragan palace in Istanbul. The construction began in 1863. The palace was designed by Armenian architect who studied in France - Nigogayos Balyan. Some say it was his brother Sarkis Balyan. Some - Krikor Balyan. Nigogayos was the art advisor of Sultan Abdulaziz. Young architect gained experience by working with his father who built the Dolmabahce Palace in Istanbul. 80,000 square meters (over 861 square feet) make up the territory of this ambitious Palace in Istanbul. The place was built in Baroque style. The walls of the palace were made of marble. Roof was made of wood, according to the tradition of those times. Wood was also used for the interior. A high wall was built around the palace which is still in use today. Beautiful garden, now Istanbul Yildiz Royal Garden (Yıldız Parkı in Turkish) was part of the complex. Park and the Palace were connected with a marble bridge. Today a road separates the garden from the palace. In 1910 the Ciragan Palace suffered an extensive damage because of fire. Some say Ottoman elite corps, Janissaries, burned the palace. Some claim the fire started because of the electric circuit. In 1989 Japanese entrepreneurs bought the palace to turn it into a luxury 5-star Ciragan Palace Kempinski hotel. In 2007 the hotel was renovated to reproduce the 19 century feel and look. The hotel defines itself as "Architectural grandeur mingling with sophisticated comfort". In 2012 Ciragan Palace Kempinski became one of the founding members of Historic Hotels Worldwide. Ciragan Palace Kempinski is a luxury hotel with superb service and historical atmosphere. 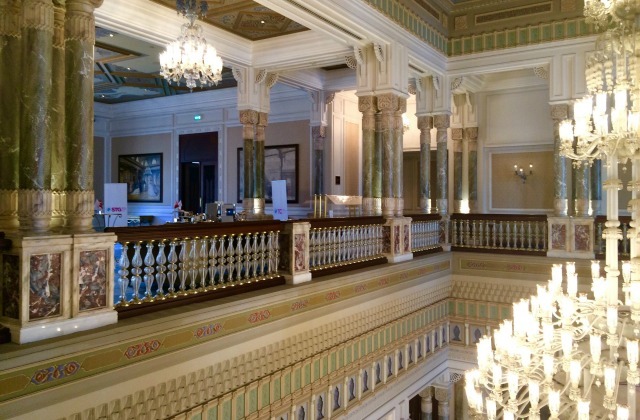 Only a few hotels in Istanbul can boast its genuine Sultan history. Overlooking Bosphorus bridge and wonderful garden this hotel sells the royal life. Choose from several exquisite guest rooms and luxurious suits they have. Start your day with organic buffet breakfast. Get massage at Turkish bath. Live royal. Get modern touch with spa, health club, personal trainer and free wi-fi. Spend your after dark hours at Laledan restaurant, Gazebo lounge, Tugra restaurant and lounge, Bosphorus grill or exquisite bars. All on the venue. Celebrate your wedding or hold a conference here. Reserve elegant ballroom and meeting venues. All with enchanting Bosphorus view. History tells Sultans were imprisoned on the territory of the Ciragan Palace to be later executed. Legends rumor love stories between wife of Napoleon III and the Sultan. See what fairy tale the genuine palace of Ottomans - the Ciragan Palace Kempinski - bring to you.